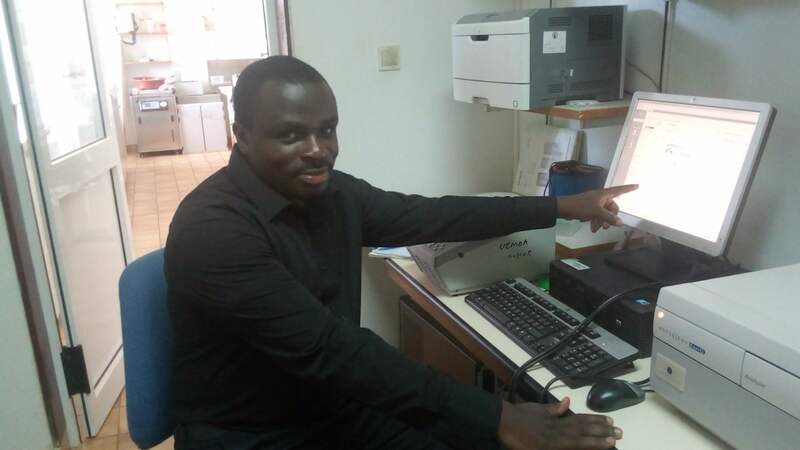 Anthony Osemene is a recipient in the Augustine Fellowship program, sponsored by American Leprosy Missions and administered by CCIH. The program supports the deployment of a Christian professional to serve in a non-medical capacity at a health facility or nonprofit organization. Laboratory Technicians at the National Public Laboratory in training on a protective Biological Safety Cabinet. The conflict and bombings that ravaged the West African country of Guinea-Bissau in the late 1990s disrupted economic growth, impoverished the country, and left the public health system weak and fragmented. Efforts to carry out core public health functions were constrained by disrupted programs, loss of human resources, weak laboratory capacity, and lack of external aid during and after the crisis. The toll on public health was severe, and the country has since faced many serious disease outbreaks, including a devastating cholera epidemic in 2008-2009 that dramatized the grave condition of the national public health system and the urgency of efforts to strengthen infrastructure and capacity. Vulnerable populations within the country continue to suffer from endemic tropical diseases, such as Malaria, Cholera, Typhoid as well as other Neglected Tropical Diseases, HIV/AIDS, and multi-drug resistant tuberculosis. Health data and records management systems are weak in the country. Monitoring, tracking for prevention and treatment interventions of diseases require efficient information management, which is critical as clinical care may increasingly be entrusted to less skilled providers in challenging circumstances. As an Augustine Fellowship recipient, I am honored to be deployed to Jean Piaget University and stationed at the National Public Health Laboratory in Guinea Bissau from August to December 2018 to build the capacity of the lab. Before my deployment I was working for Science Resources Africa in Nigeria as an Information Technology Expert. Jean Piaget University is a non-profit and non-governmental educational institution that is collaborating with the National Public Health Laboratory and related national institutions for the development of human capital in support of health care services. 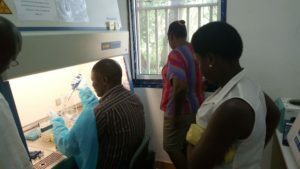 At the laboratory, I am focused on setting up an intranet; reviewing current data collection systems; setting up databases on the central system that will be accessible by the various laboratories; training the lab workers on the use of the intranet; and conducting a comparative study on the new electronic system and the former paper-based system of collecting data. The National Public Health Laboratory and Jean Piaget University are looking into more ways of improvement in regards to research, investigation, recording and reporting of identified diseases for treatment and effective control and monitoring by exploring economically affordable technologies and taking advantage of open source, inexpensive and low power hardware that can be used to facilitate training and research initiatives. Examples of such technologies are the Raspberry Pi computers that cost about $35. This can be used to gather relevant information and help to enhance the development of a solid chain in the health and management system of the nation. Concurrently, we are designing and developing websites for both the National Public Health Laboratory and Jean Piaget University in support of the collaborative capacity building efforts by both institutions. We are also looking at the possibility of setting up Moodle which is a Learning Management System and an Interactive training platform in addition to its capacity building mandate. The National Public Health Laboratory has a server setup and fully functional, our next priority is to setup the infrastructure that will accommodate everyone to be able to share resources via the intranet. A comprehensive training will be done along these lines for both the students, laboratory technicians and workers. I believe the experiences I have had during my time as a Fellow have equipped me with many valuable skills, expanded my professional network and also stretched my technical abilities as well. I must also mention that my Portuguese language skills have improved. The program has helped me develop my skills further, broaden my knowledge and expanded my portfolio of professional experience. Every day is an opportunity to learn and grow and become more, which for me is an adventure of endless possibilities.